We Wish President Jonathan Many More Years to Transform Nigeria’s Football- Maigari. The president of the Nigeria Football Federation (NFF) Alhaji Aminu Maigari has said the nation owes its impressive run of football success in 2013 to the ardent support and encouragement of President Goodluck Jonathan. Nigeria recorded successes in several competitions it took part in this year, most notably was winning the African Cup of Nations (Afcon) in South Africa in February after 19-year wait. Most recently, the nation’s Under-17 team led by coach Manu Garba clinched a record fourth FIFA World Cup title. The last but not the least, Nigeria reached her fifth FIFA World Cup slated for Brazil in 2014. President Goodluck Jonathan Witnesses Eagles Training Session in Addis Ababa. While congratulating Mr President (GCFR) on his 56th birthday, Maigari lauded the Nigeria first citizen’s commitment in the area of football. “The Nigeria Football Federation and the entire Nigeria football family wish Mr. President long life, prosperity and many more years of active support and love for Nigeria football. We are enamoured by his keen interest in the development of the Nigeria game. “Mr. President’s special interest in the development of Nigeria football is matched by his commitment to providing the resources for our National Teams to excel internationally and his encouragement of our players through cash and other rewards after impressive outings,” Maigari said. 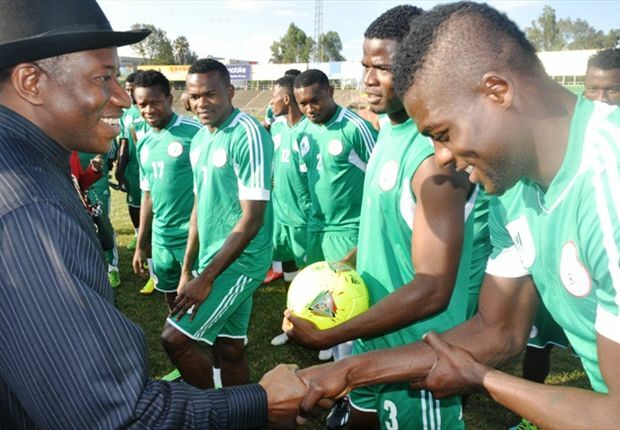 President Jonathan, if you could recall, visited the Eagles training session in Calabar ahead of their 2014 World Cup qualifier against Malawi and also in Addis Ababa, where they trashed Ethiopia 2-1. “Our leader is truly transforming Nigeria football, nay Nigeria sports, and we pray for several more years ahead for him to take our sports to higher heights,” Maigari added. Previous articleTony Pulis Becomes Palace New Manager.